We need one more student for the Olds Master Weaving program here in Prince George. There are some advantages to taking the class here - no distractions, six days (rather than five) of intensive class work. Looms provided (unless you want to bring your own table loom), small class, lots of attention from the instructor (moi!). Heard today that there are four people registered for the Prince George class. We need six to make it 'go'. If anyone is interested, now is the time to register. I learned how to knit when I was around five or six. Long enough ago I don't really remember not knitting. I did the usual scarves, toques, slippers. I even, the winter I was 11, knitted 45 pairs of Phentex slippers at a dollar a paid for the local knitting shop. She could never seem to keep them in stock and I was saving up money for a new bicycle. Knitting these days is pretty simple stuff. I have knitted Aran sweaters, Lopi sweaters with Fair Isle patterning, afghans, baby things for friends, sweater for myself. These days, though, I mostly knit very simple things, using up weaving yarns that are too little to weave with, too much to throw away. These scarves are donated to various worthy causes in town. On holiday I ran out of hand work and was forced to buy some yarn. And needles, not for this but for the other yarn I bought. 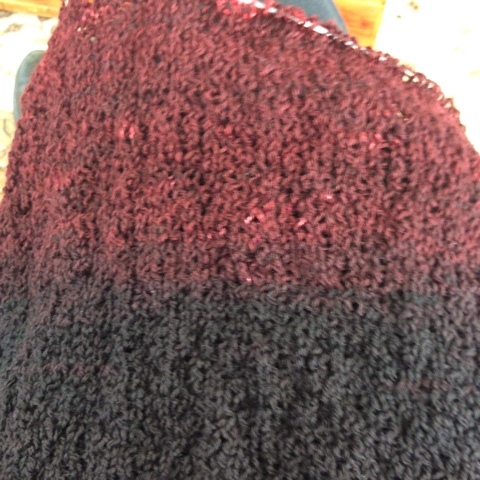 Now that I'm home, and need some knitting for an all day commitment tomorrow, I started this yarn. It's actually my second attempt because I didn't like the first one. Didn't like the size needles or the stitch I'd chosen. 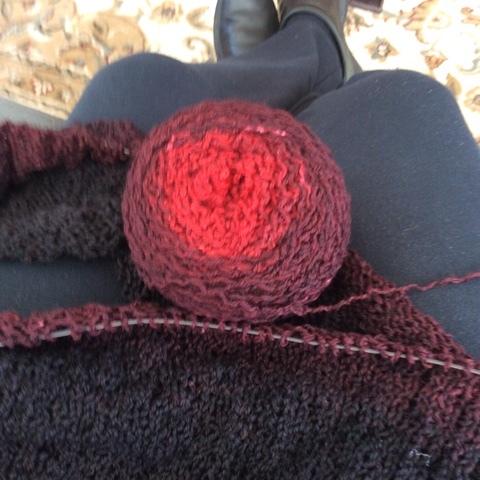 The nice thing about knitting is that it comes out easily. So I ravelled what I had done and started over. Much happier with this version. As a Follow up to yesterday's post, my lace seminar on Craft University has apparently been taken down. I'm disappointed as I understood it would remain up for people to take, much like the webinar on the Interweave Press site, the A Good Yarn topic. Oh, well. 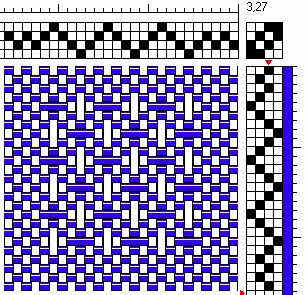 Many people find lace weaves confusing, not least because there are so many different ways to write the threading/treadling draft. When the sequence looks so very different, people can get confused about what is the 'right' way. Well, the 'right' way is which ever sequence - threading, tie up, treadling - that will give you Huck (or Swedish, which is a derivative of Huck) interlacements. 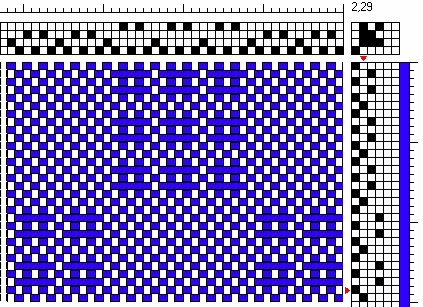 Lace weaves consist of floats on a plain weave foundation. You can have warp floats, weft floats or warp/weft floats. Bronson Lace differs from Huck/Swedish in that the foundation threads are only on one shaft with a tie down on a second shaft. In Huck there are two shafts for the foundation threads and no tie down. 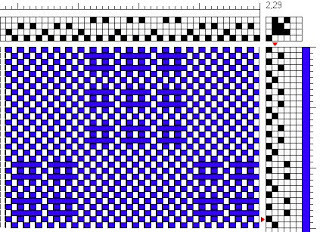 Swedish Lace has two shafts for foundation and a tie down where a unit is repeated. Can I recommend my webinar to help bring some light to the subject? I tried searching for the webinar on their website but nothing came up so hopefully this link will work for anyone interested. There are many video clips on You Tube, some of them better than others. I don't claim mine are the best, but I have added my voice to the internet. Everyone learns differently and the recent influx of new weavers, either via rigid heddle looms or baby wraps means that the population of weavers has dramatically increased and the average age has dropped. Which, don't get me wrong, is A Good Thing! 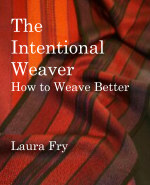 If we don't recruit new younger weavers, the craft really might begin to die out - and that would be a great pity imho. But rather than paint *all* video clips on You Tube and *all* dvd's as being bad, people should view them, take them with a grain of salt, but most of all, learn as much as they can from them. In my opinion there is nothing better than learning from a live human being, but if you don't have the budget, or are too geographically removed or tied down with family committments to be able to take a class, then books, video clips and dvds are a valid way to learn. We all do things differently because we all have different strengths and weaknesses. We all have different abilities. We learn in different ways. Some can learn by reading, some by watching, some by doing, some by all three. All I hope is that, at the end of the day, what I have done helps someone somewhere. From the messages I get from people, I think I have helped some people make progress along the road of learning. Why am I buying this yarn? 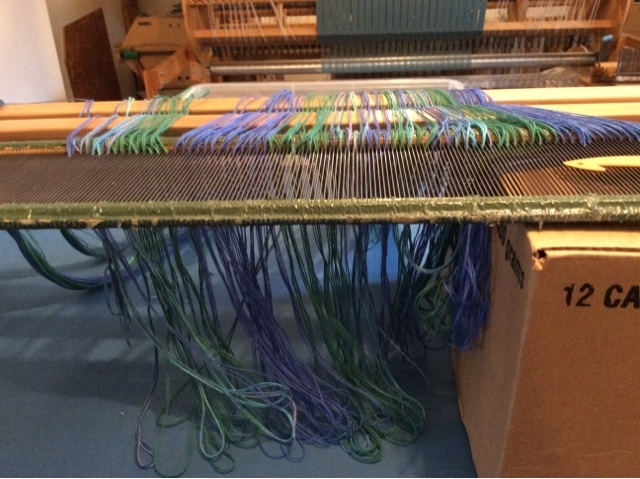 Well, I wove with it for about 9 years so I'm quite familiar with it - how it behaves in the loom, how it weaves up. I will have to sample to determine how it will work in my own designs, not hers, because I have my own approach to design and requirements. 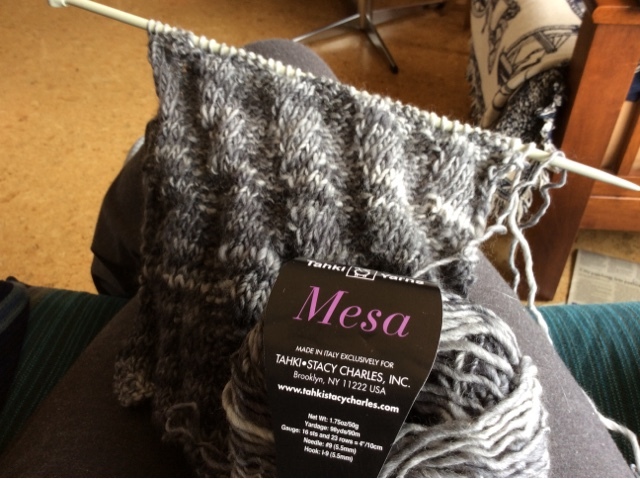 I had been sort of casting about for a new scarf/shawl design and this opportunity kind of fell into my lap, so to speak. I will have two weeks to try and figure out where the yarn will go and see about clearing my schedule in order to do some sampling. Today I worked on marking a little bit and tomorrow I will open the next box. There are at least two more students sending their work in, the Beginning Weaving workshop April 16/17 (for which I need to order more cotton! ), the Olds class here if it goes ahead, the workshop in Edmonton (more yarn needed for that?) then Olds Fibre Week in June (yet more yarn). So much for stash reduction! 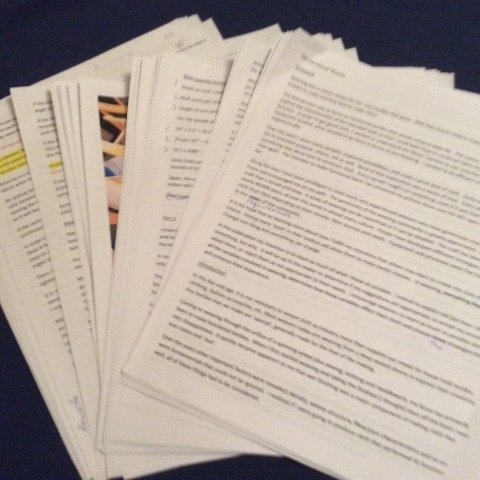 In between there is writing to be done - beginning with the revisions we worked on during my 'working holiday'. And of course there are all those warps I wound before I left, the rest of the tea towel warp on the AVL and a couple other commitments for the AVL as well. I'm old enough that I remember when the convention for writing a straight progression (aka twill) was from the rear most shaft to the front most shaft. Somewhere along the line, the convention got turned around and pretty much all 'new' publications show the progression beginning on shaft one going towards the last shaft. I find this older convention easier to thread. 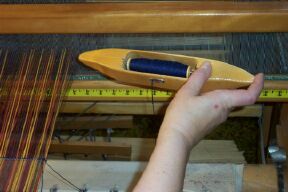 I hold four (or more, depending on the repeat) ends in my fingers, threading all the threads in order. For me this is less stressful on my body and makes things go a lot smoother and therefore more quickly. For all those people who say they aren't concerned about how fast they can thread, all I can say is that the posture for threading is uncomfortable and the longer I have to stay in that position, the more my body hurts. So yes, I am concerned about how long it takes to thread because I don't like hurting for my craft! I also like to get to the zen part of weaving where I can sit and throw the shuttle and weave. For me that is the happy part of weaving (and no, I don't get bored if I have to weave more than one of something). 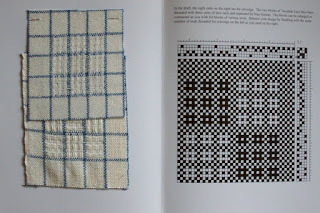 I love getting messages from people saying that they have adopted some of my methods and that weaving is less frustrating and they are more productive. One recent message said that instead of taking four hours to thread, it now took 45 minutes. That is a significant savings in terms of sitting in a cramped uncomfortable position. There has been discussion on some of the chat groups about where the 'proper' placement of the lease sticks is. Gather any six weavers together and you will get six different methods of beaming a warp. Hence my recommendation to choose an expert, learn their method very well, then adapt that method to best suit your needs. Become your own expert. Also understand that any threading is not written in stone. 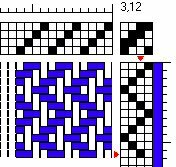 Using Fiberworks and the 'shaft shuffle' tool, I can take any threading and rearrange it to better suit my needs - like changing a straight progression from shaft one through to four, to four through to one as shown above. I am having a much harder time than I had hoped getting back into the swing of studio things. Yesterday turned into a 'people first' kind of day although I did get my cheque book balanced and some bills paid. But I ran out of energy by 4:30 so we had an early dinner and vegged for the evening catching up on some tv. Today I had appointments in the morning and errands after lunch so it was going on for three before I even thought about the studio. Not being overly endowed in the little grey cells department, I looked at all the boxes and bins with wound warps and decided to tackle the one towel warp. I thought - briefly - about firing up the AVL and decided I didn't want to deal with it. I wanted something that I didn't have to think about and between the very bland place mat warp and this bright cheerful towel warp, the choice was easy. Rough sleying took just a few minutes, then the loops were put onto the apron rod. The warp was then passed under the breast beam and over the valet. The lease stick were moved as close to the ceiling as possible. 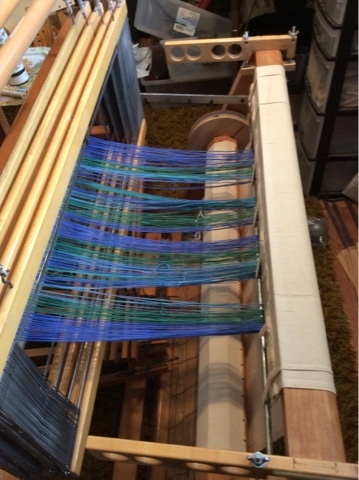 They have 'caught' any minor slack in the warp ends and I can now begin rolling the warp onto the warp beam. When the weights are close to the valet I will remove them, groom the next section, one half of the warp at a time, and when both halves are as good as I can get them, the lease sticks will again be moved to as high as they can go. The warping valet allows me to groom at least a yard or a little more at a time. For this 11 meter long warp, I will re-position the weights about eight or nine times. Beaming this way takes only a few minutes and then I can start threading. I should be able to start weaving on this warp after my errands tomorrow. Art - What is it? I don't call myself an 'artist'. I accept weaver, crafts person, even 'master' - I got the paper that says so. But I don't think of myself as an 'artist'. In this day and age, being an 'artist' generally holds the connotation of someone who is trying to reflect back to society a new way of looking at something. Their role appears to be one of provoking thought - sometimes gentle, meditative thought, sometimes revolutionary thought, but a reflection of what is, and what might be instead. All I want and hope to do is make good textiles. I am a solid blue collar kind of girl. I aim to make my textiles as beautifully as I can. I carefully consider colour, design, but most of all, function. I call my textiles 'mundane' in that they are in existence to be used, preferably daily. When people tell me my tea towels are too 'nice' to use, I wonder who said a tea towel wasn't supposed to be pretty while it did its work? When did our society determine that pretty couldn't also be useful? That the everyday chores of life and living were meant to be drab or bland? The dishes need to be dried, why not do it with a cloth that feels good in our hands and is delightful to look at? I can't draw worth beans, so for the tapestry problem for level four of the Guild of Canadian Weavers master level certificate, I went for the 'primitive' look. I happened to have all of these yarns, already hand dyed. The frame loom was set up with a linen warp and for the background I used two warp ends as one, then split them into individual ends so that I could achieve greater detail for the central motif - my butterfly. 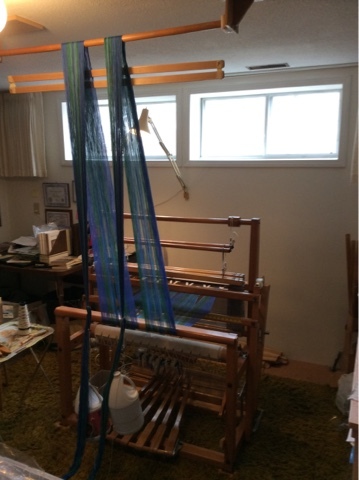 In the photo, the warp is running side to side as that seemed to give me the most freedom and least angst than trying to weave the design from bottom to top. It made weaving the 'leaf' shapes in the background much easier, too. The tapestry took literally years to complete because I'm not really interested in doing tapestry. When I'm weaving, I really want to be throwing the shuttle, not carefully passing weft butterflies through the hand picked sheds. Then not liking how the shape was progressing and taking out and starting over. My meditation in weaving comes from the aerobic activity of treadling, throwing the shuttle and beating, not the careful consideration of each thread being placed to create the design. That is not to say that I consider tapestry weavers less - or more - of a weaver - they are just doing something different than my personal preference. 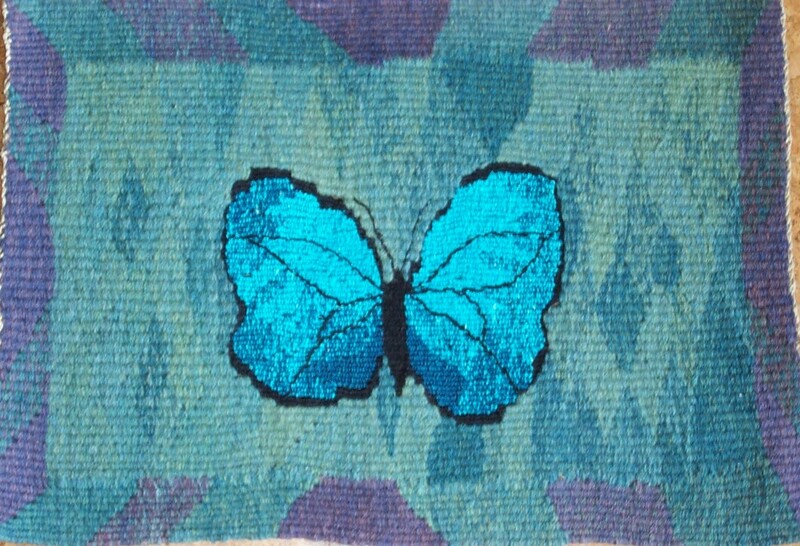 I have the greatest respect for tapestry weavers. That said, what I do does require a level of artistry because I am still working with design fundamentals and colour theory. But my purpose is not that of an artist. I did the above tapestry because it was required, not because I enjoyed it. I think it's fine, but it isn't a 'great work of art'. It was a problem to be solved for marking and my only hope was that I passed. The only thing better than going away for a while, is heading home. We closed out our holiday with a stopover in Cloverdale, me to help with the guild booth, Doug to visit with friends/siblings. The weather was pleasant, a little chilly, but warm enough for March. Flowering trees are in bloom, the grass is green, daffs are up. I'm sure home isn't nearly as spring like! Serendipity was in full force and I re-connected with my high school bestie/bridesmaid on the ferry, both of us far from home. We spent the sailing catching up. And an ex employer, selling off her yarns let me know in time that we could swing by her studio and I bought mumble mumble pounds of yarn. Deep discount and no shipping, how could I not? Fibres West was busy both days and many people expressed an interest in the conference. Birthe and the guild members did a great job spreading the word about the conference in 2019 in Prince George. A number of people also asked about the Olds program so I am hopeful the class will get the go ahead. But now it is time to head north and back home. My own bed tomorrow. It's time! 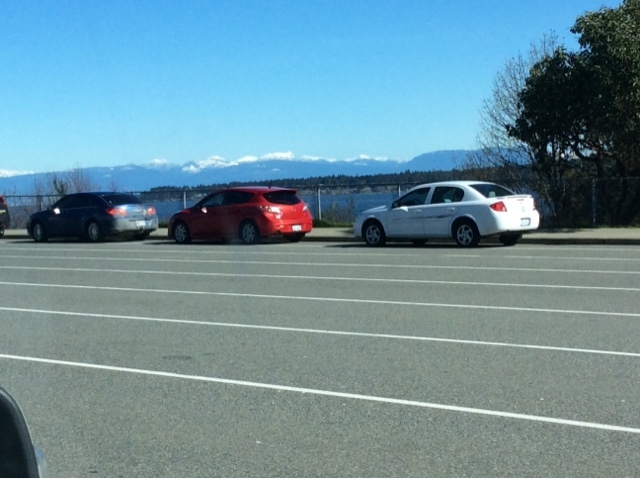 A beautiful spring day makes the wait for the ferry pleasant. There is wifi in the parking lot so I have been catching up on chat groups, some of which have been very active! 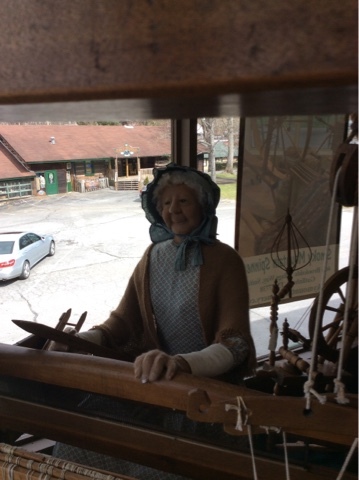 We had a brief but very nice visit with friends, plus visiting with some of the textile people in the area, which was a bonus. Now we are headed back to the mainland and Fibres West at the Cloverdale Exhibition Centre, where i am looking forward to seeing lots more current and new fibre friends. 46 closely packed pages of text, photos and drafts which are, in reality, more like 75 plus pages, with suggestions for changes and marked typos to be corrected. A brief chat with a couple of 'real' authors helped put the writing experience in perspective. It doesn't matter if it is fiction or non-fiction, writing takes time, thought and organization...whatever form that may take. It also takes reflection and editing. Sometimes many times. Frequently, many times. Communication is not a one way street, although it may seem like it as I struggle to find the right words, the correct phrases, to express what I want to say. By having someone else (preferably several someones) edit my words and let me know if they understand the concepts I am trying to convey, hopefully the message will be understandable. We return home on Sunday with a pile of deadlines and obligations waiting. I have to find some references before I will dig back into the writing. I am far behind where i had hoped to be in terms of word/page count this far into the year, but it is really beginning to feel like a book. A real book. 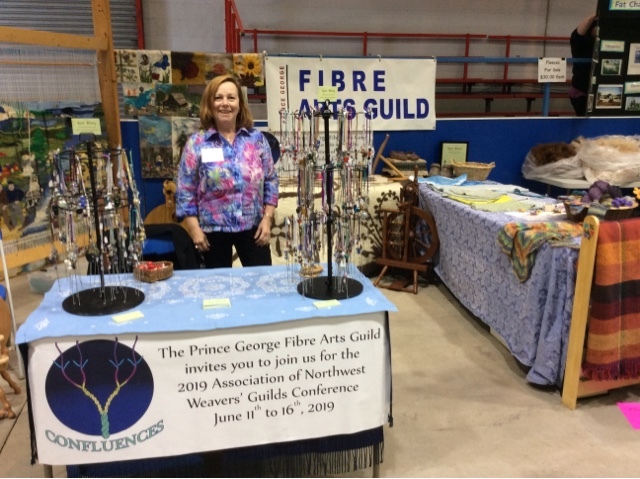 Registration for Olds Fibre Week opened on March 8 and it looks like just one more student is needed for the level one class there, and one more for the level one class in Prince George. This is very exciting news! I also heard the satellite level one in Yadkin, NC is full with a waiting list. We are still on the road with lots of visiting done and more to come. I will be in the guild booth at Fibres West on Friday and Saturday and look forward to meeting many more old and new fibre friends. Once home I have loads of work to do, primarily the marking for Olds as the students are anxiously waiting to hear if they have passed their homework. And then it will be back to writing and weaving. Spent much of yesterday knitting. I could get used to being on holiday. Today marks the halfway point of our holiday. It has been great meeting with old and making new friends. And it isn't over! On Saturday someone on Ravelry is having a get together, so I'm looking forward to meeting more fibre friends. But I am also beginning to think about what needs to be done when I get home. Marking, teaching, weaving and, somehow, fitting in writing. Now that my right hand person has begun editing, The Book is beginning to take shape and the search for typos and missing information will begin. I am also looking forward to a change in medication which should help my energy levels...with any luck at all. Since I ran out of hemming, thanks to the hemming fairies, I needed some other hand work to do. I had left my knitting in Seattle but the Smoky Mountain Spinnery was just down the road, so I bought a circular needle and some 'blank' dyed yarn and set about knitting a shawlette. Cindy and I have spent some time working on The Book and today she is working on some of the photos and will drop them into the text so that we can begin to see the shape of it. By doing this now, I know, or will know, what additional images are needed so I can take them once I'm home again. We have also identified areas that need to be expanded and missing info that needs to be added. I am blessed with friends who willingly get involved in my crazy ideas and not only support but actively encourage me!